While most of the news about vitamins concentrates on their usefulness as nutrients, a new study shows that they can also make prescription drugs more effective. A recent Brazil study has linked the intake of certain B-vitamins with better performance of a commonly prescribed pain medication. The drug is called diclofenac and it’s used to treat lower back pain. Chronic lower back is often treated with pharmaceutical drugs, but they don’t always work effectively or, if they do, it’s often for short periods only. 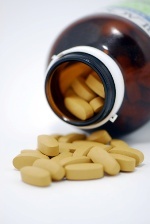 The Brazilian researchers compared a twice-daily oral administration of either diclofenac alone or the drug plus three B-vitamins (B1, B6 and B12) in 372 patients. The researchers found that, after three days of treatment, a statistically significant higher proportion of subjects in the B-vitamin/drug therapy group reported treatment success. Furthermore, the combination therapy yielded superior results in pain reduction, and improvement of mobility and functionality. Mibielli, M.A., et al., “Diclofenac plus B vitamins versus diclofenac monotherapy in lumbago: the DOLOR study,” Curr. Med. Res. Opin., Nov. 2009; 25(11): 2,589-99.